Here are two approximately half-hour discs, interspersing album excerpts with comments from the respective artists. Songs from The Capeman and Orange Crate Art might not be their creators' best works ever, but there is certainly great stuff to be found in both albums, and these discussions of the process involved in their creation should be interesting for fans. For an additional entry in the "Words + Music" promo series, see my Elvis Costello Interview Trifecta post. Oh yeah, and I try and say "The Rare Stuff" towards the end of every post -- so there, I just did! :^) Enjoy! Hmph. Three times I've tried downloading the Van Dyke Parks/Brian Wilson disc, and none of those times have been successful. What's going on?!? Didn't even know there was one for PS' The Capeman -- THANX! furr -- I hope you mean "Hmmm" and not "Hmph"! :^) I just checked the link and it worked for me. Have you successfully used Megaupload before, but it's just not working this time? Could the file have downloaded to somewhere on your drive other than where you're looking for it? I hope the problem resolves itself, if not let me know and we'll see what we can do. Rob - You're welcome! There's one for the You're the One album too, which I don't have but want to find, even though I actually prefer Capeman to that album so am more interested in this interview. If you didn't know, iTunes exclusively has the full Broadway soundtrack to The Capeman, two discs worth with a bunch of material not on the Paul album. Hi again. Still doesn't work. Usually I have better luck with Megaupload than this. I repeat... Hmph. Any other solution? Success at last!!! :D Thanks for the alternate link - and of course, the album!! still appears to be working. ...and Megaupload always works rather well, in my view. have you ever come across the Words and Music Cd for paul simon's the rhythm of the saints? 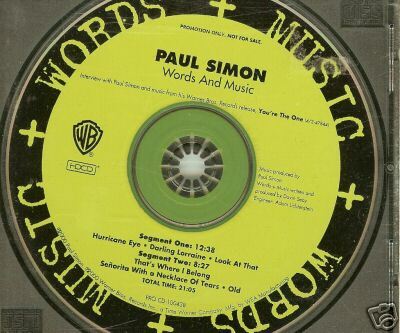 Im am so sorry for not being able to download this Paul Simon rarity. Megaupload has gone a very long time ago. It suddenly vanished. Will you please be so kind to upload this disk also to Mediafire? I thank you in advance for doing so! Kind regards from Holland! OMG I am so grateful to you the Mediafirelink is still working after ONE year!. Tonight Paul Simon will strat his #Farewell #Tour in Vancouver. Hope all will go well. Greetings from Holland!